I make low fired decorative ceramic bowls in my Nottingham studio from black & terracotta clays using the press-moulding process. My brooches are cut from hand rolled slabs of clay. 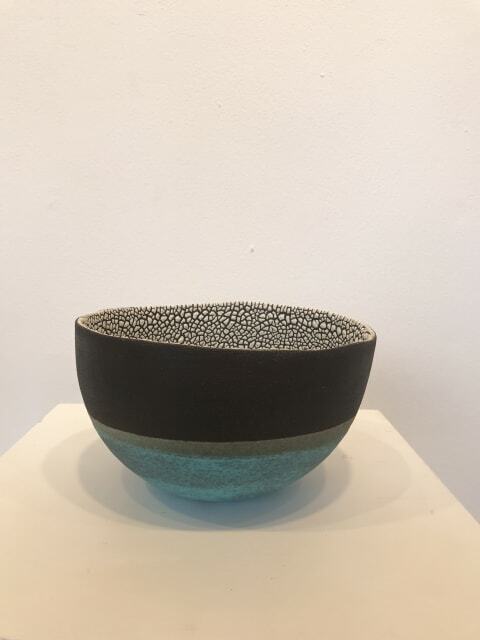 After applying slips and biscuit firing the work at 1000ºC I dip and pour on a range of glazes, including vibrant matt turquoise and purple barium, and textured 'crawl' glazes, so called because they pull or 'crawl' away from the clay surface as my electric kiln heats up to 1055ºC. I draw inspiration for my work from observations of the natural world absorbed throughout my life - from childhood memories of seaside holidays spent beachcombing and rockpooling, to things I see around me from day to day such as lichen growing on a stone wall. I graduated in 1999 with a BA (Hons) in Decorative Arts from Nottingham Trent University, and in 2003 I was awarded a business start up grant from the Prince's Trust.